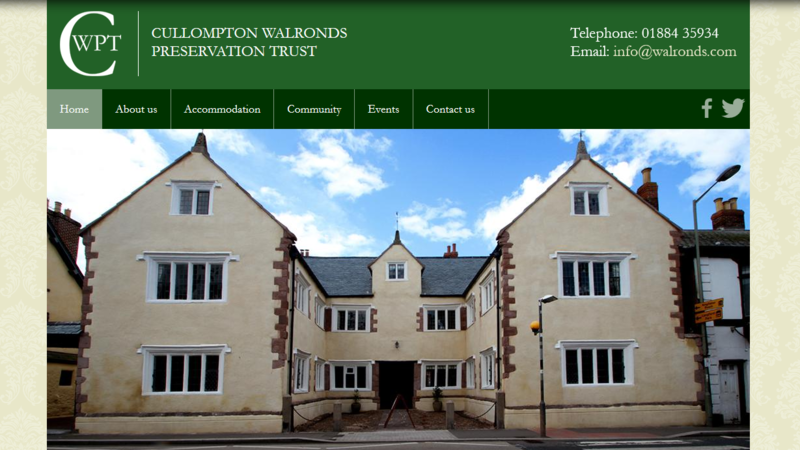 The Cullompton Walronds Preservation Trust (CWPT) is a building preservation trust whose general objective is to preserve buildings of historic or architectural interest in the parish of Cullompton. It is one of a chain of trusts associated through the UK Association of Preservation Trusts, helped and encouraged by the Architectural Heritage Fund (AHF). Members of the CWPT gathered together in 1996 and registered with Companies House and the Charity Commission in the Spring of 1997. The Walronds website has the ability to feature upcoming events, as well as stunning galleries to display pictures of the buildings. This was all created in line with the CWPT branding, and using the great images supplied.